Thank You for watching Huobi Talk: Hadax Chapter 4-Which might be the next Super Token? YCC — Supply Chain Funders and NTK-Harnessing AI at 24 Feb 2018, 8pm (GMT+8). HADAX is delighted to announce the winners of 24 Feb 2018 Airdrop Prize pool of a total 24,450 YCC and 5,000 NTK. The livestreaming session clocked a total of 365 live viewers, with a finalised list of 489 qualified UIDs. Each UID will be entitled to 50 YCC and 10 NTK tokens. If the projects are listed successfully on HADAX by end of March 2018, the winners will be airdropped with the tokens accordingly. For those who had missed the YouTube Live streaming, please refer to the link below to watch the playback at https://www.youtube.com/watch?v=MNFFsxZAsHo. This chapter covered interesting facts supply chain ecosystem and the wonders of artificial intelligence. 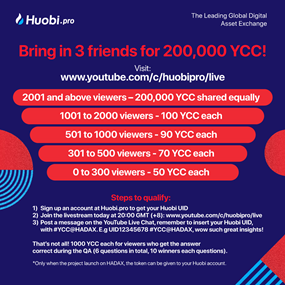 Catch our next live stream at https://www.youtube.com/c/HuobiPro/live every Thursday, starting from 08 March, 12pm (GMT+8). Congratulations to the following selected winners who participated in our sharing of livestream at www.youtube.com/HuobiPro/live and entered the correct format in our YouTube Live Chat. 1) Winners and the amount of airdrop tokens are subjected to Huobi and projects’ discretions. 2) The airdrop will happen after the project successfully gets listed onto HADAX for trading by end of March 2018, IF the project is not successfully listed, then there will be No Airdrop. 3) Only 1 UID per user submitted via the YouTube Live Chat will be qualified for the Airdrop, multiple UIDs submitted by the same user or similar user names detected will be disqualified. 4) Follow us at https://twitter.com/Huobi_Pro. Subscribe to http://www.youtube.com/c/huobipro. Thank you for choosing HADAX as your preferred Global Digital Asset Exchange. EGCC, SHE, MEX, IIC, GSC, UC and UIP are now available for deposit and trading in HADAX.